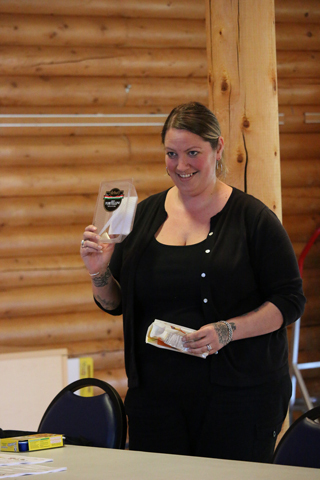 On May 20, 2016, Northwest Indian College’s Restorative Teachings Early Childhood Education Initiative, in partnership with the NWIC Early Learning Center, hosted a family engagement event, including a luncheon and introduction to the Restorative Teachings grant project. 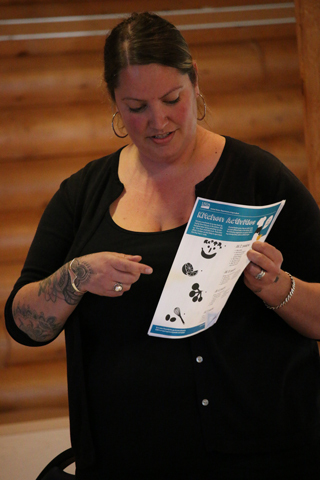 Most importantly, the purpose of the event was to invite parents and family members of young children at NWIC’s ELC, our formal early learning partner in the Restorative Teachings project, to engage in the Initiative’s visioning, planning, and development process with us. 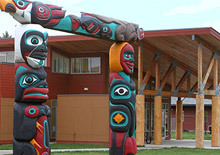 The event planning team, which included members of the Restorative Teachings Coordinating Team, felt that child nutrition (specifically, whole child health and wellness and family security) would make an excellent family education and discussion topic for our introduction to the Restorative Teachings project. 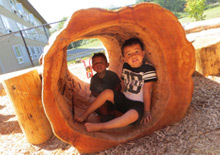 The planning team identified several specific topics related to these goals, which were targeted to the developmental stages of the children enrolled at the NWIC early Learning Center: Infants, Toddlers, and Preschoolers. As toddlers are often at the in-between stage of outgrowing infant foods, but still transitioning into table foods, we wanted to address common questions about introducing young toddlers to more complex (yet easy to prepare) foods and involving them in family mealtimes. Many parents struggle over when and how to transition older infants and young toddlers from self-directed meal schedules to more regular mealtimes with the family. It can also be difficult for parents to buy and prepare affordable and nutritious meals that will keep everyone in the family happy. To address this common family dilemma, which can be a barrier to child nutrition as well as a financial burden, we decided to demonstrate to families how they might plan easy meals, prepared in advance, that are more nutritious and more affordable than store-bought / pre-packaged options sold by baby food companies. 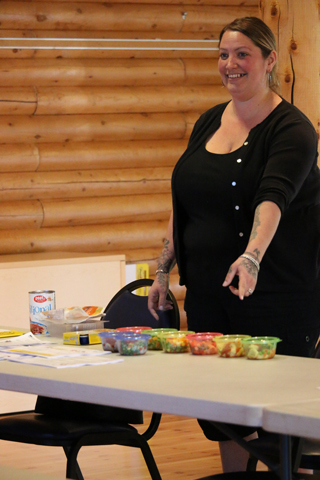 Alicia Allard, Early Learning Center Director, led a nutrition demonstration, comparing healthy homemade versus pre-packaged food options. 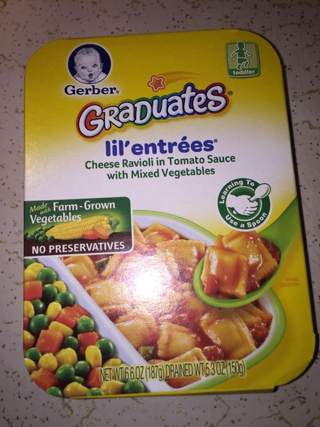 She had purchased a box of name brand “Graduates” Cheese Ravioli in Tomato Sauce with Mixed Vegetables from a local grocery story. This food item is marketed to toddlers who are beginning to eat mixed texture foods and learning to use a spoon, which is the age that many families begin to integrate their child into the family table. It is also the stage when overwhelmed or unsure parents may feel these premade meals are a quick option for a transitioning eater. 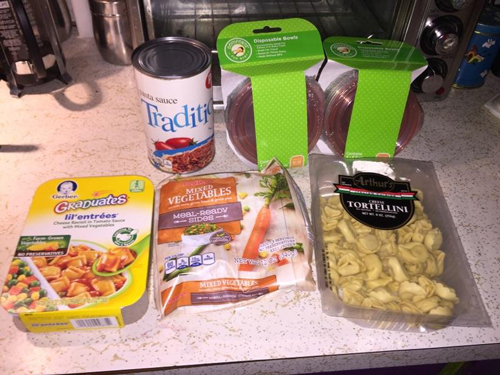 While at the store, Alicia also purchased one pound of fresh cheese tortellini, one can of spaghetti sauce, one pound of frozen organic mixed vegetables, and two packages of storage containers. 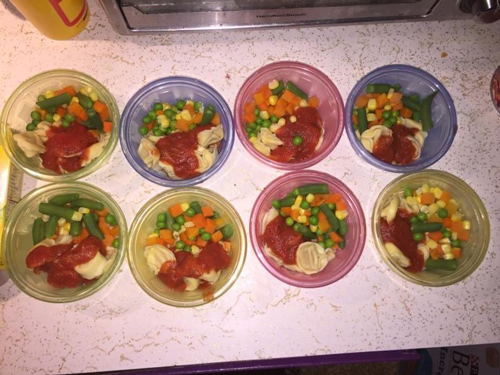 With 15 minutes and some boiling water, she made eight individual servings of Cheese Tortellini with Tomato Sauce and Organic Mixed Vegetables that can be stored in the freezer for up to three months. As exemplified by the aforementioned prices and details, the homemade version of an identical pre-packaged meal is healthier, more nutritious, and more cost-effective for families. Furthermore, since several families at the Early Learning Center have children of various ages, this demonstration also noted that these meals could be adapted for older children by doubling the portions and storing them in larger freezer and microwave safe containers. We also distributed handouts to go along with this demonstration, which included the above price comparisons, cooking instructions, storage information, and comparisons between other name brand infant and toddler foods versus more nutritious and more cost-effective homemade alternatives. Families with preschool age children are more likely to have questions about picky eating, establishing healthy eating habits, and mealtime routines. Therefore, to address these topics, we shared information from the USDA Child Nutrition “My Plate” program that specifically addresses ways in which to engage preschool age children in selecting, preparing, and eating healthy foods. These suggestions include engaging children in games during shopping trips, encouraging children to pick out a healthy food item of their choice, such as a new fruit of vegetable to try, and having children participate during meal preparation. We also shared the list of helpful phrases to use during mealtimes provided by the USDA Child Nutrition program. These conversation starters for mealtimes are positive and non-punitive, and are the exact phrases that ELC staff members are trained to use to encourage healthy eating during mealtimes at school. 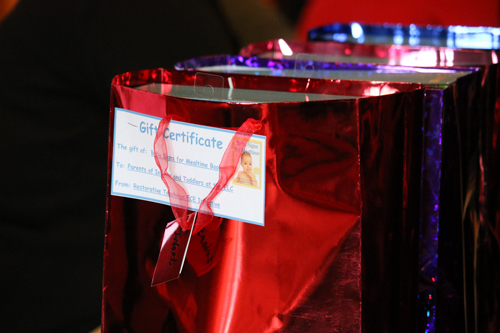 As a token of our appreciation for their time, input, and guidance, families received gift bags containing developmentally appropriate items to support positive eating habits and interactions. Families with infants and young toddlers received information about making and storing fresh infant food and the economic and nutritional benefits of homemade versus store bought baby food. 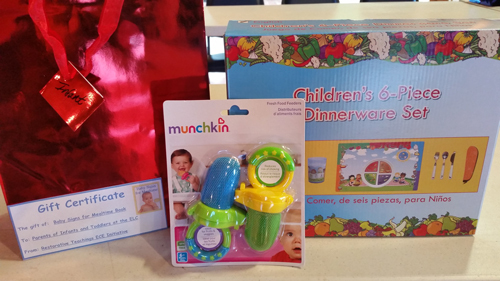 They also received information about introducing solid foods to infants and toddlers and food safety practices to prevent choking as new eaters explore new foods. Infants and toddlers received gift bags containing a Baby Signs for Mealtime board book, a “My Plate” dinnerware set based on the USDA recommended servings for infants and toddlers, a mesh infant fruit feeder set (infants only), and a copy of the book, Raising a Healthy, Happy Eater: A Parents Handbook: A Stage-by-Stage Guide to Setting Your Child on the Path to Adventurous Eating. 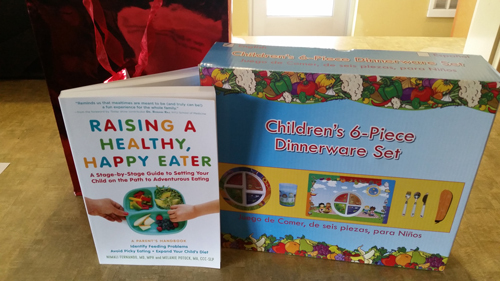 Families of preschool children also received a copy of the book, Raising a Healthy, Happy Eater: A Parents Handbook: A Stage-by-Stage Guide to Setting Your Child on the Path to Adventurous Eating. 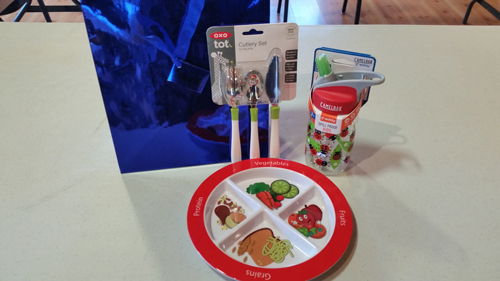 Additionally, their gift bags included a child-sized “My Plate” portioned meal plate, a reusable sport water bottle, and a child-sized utensil set. 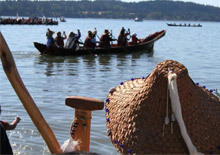 All of the families in attendance were intrigued with our ideas for the Restorative Teachings ECE Initiative, gave input and guidance on grant project ideas (in the form of “visionary statements for a healthy Native child,”) and expressed gratitude for the developmentally specific child nutrition and meal planning information and gifts. We look forward to continuing to provide support and information to families that empowers them and encourages their connection to the NWIC Early Learning Center as a family resource.